My inverse PCR reaction using the Q5 High Fidelity polymerase (creates blunt ends) worked on the first try! I now have the antitoxin-deletion fragment I can ligate to a SpecR cassette to create the antitoxin knockout plasmid. Running 1/10 of the reaction in a gel gave a reasonable band, so I think I have enough DNA for the next steps. I was initially planning to cut the SpecR cassette out of a plasmid the Honours student made, but we didn't have any of the blunt-cutter (BstZ1) this would need. Since money is tight, I decided to instead do what the Honours student had done, using her primers to amplify the fragment with the Q5 High Fidelity polymerase, adding 5' phosphates with T4 polynucleotide kinase and ATP, and then blunt-end ligating this with the inverse PCR fragment. The SpecR PCR didn't work the first time, using the Honours student's plasmid as template. The plasmid DNA didn't look very good in a gel, so after consulting with the Honours student by email I tried using some chromosomal DNA she had made from another knockout mutant. This worked very well. 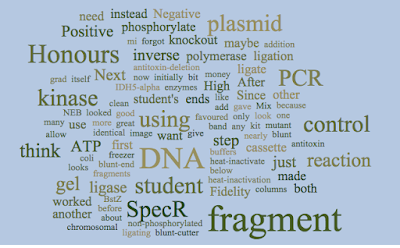 My only concern is that in a gel the SpecR fragment had a short smear of what looked like shorter DNA below it (sorry, forgot to save photo image). Next step will be to clean up both PCR products. The Honours student did this by gel purification, using a kit favoured by the sabbatical visitor, but I think I'll just use our usual spin columns. The grad student warns me that the recovery won't be great, but I think I have DNA to spare. Next step will be to phosphorylate the 5' ends of the SpecR fragment. This procedure looks very straightforward. I could also treat the inverse PCR fragment, but this would allow that fragment to ligate to itself, creating many side reactions that I don't want. Then maybe another spin-column step, because I think I should remove the kinase so it doesn't phosphorylate the other fragment. But I could instead just heat-inactivate the kinase (20 mi at 65°C, says NEB), since the kinase and ligase enzymes have nearly identical reaction buffers, and both use ATP. After heat-inactivation I'd just need to add the other fragment, the ligase, and maybe a bit more ATP. Then transform into competent E. coli (IDH5-alpha? I'm pretty sure I have lots in the freezer) and plate on spectinomycin. The plasmid I want should give resistance to ampicillin too. 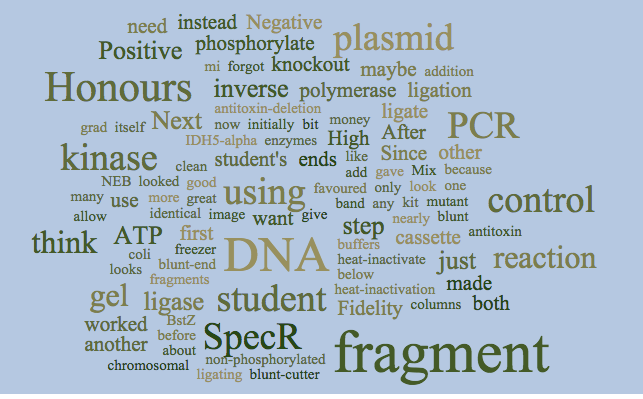 Negative control: Mix of fragments before addition of ligase. Negative control for transformation: No DNA. Positive control for ligation: I'd need to digest a plasmid. Positive control for transformation: One of the Honours student's successful plasmids.